I was sad to learn today that Tim Fuerst has passed away. Tim received his PhD from Chicago in 1990, was the William and Dorothy O'Neill Professor at the University of Notre Dame, and had a long relationship with the Cleveland Fed. Tim was one of the most enthusiastic human beings I have ever met. He did pathbreaking work on liquidity effects, and his joint work with Chuck Carlstrom at the Cleveland Fed was very influential. It's tragic to lose such a productive researcher and teacher at the peak in his career. Here's an article on Tim in the University of Chicago Magazine. We're starting to hear some public discussion about Fed balance sheet reduction. For example, Jim Bullard has spoken about it, and Ben Bernanke has written about it. The Committee intends to reduce the Federal Reserve's securities holdings in a gradual and predictable manner primarily by ceasing to reinvest repayments of principal on securities held in the SOMA. 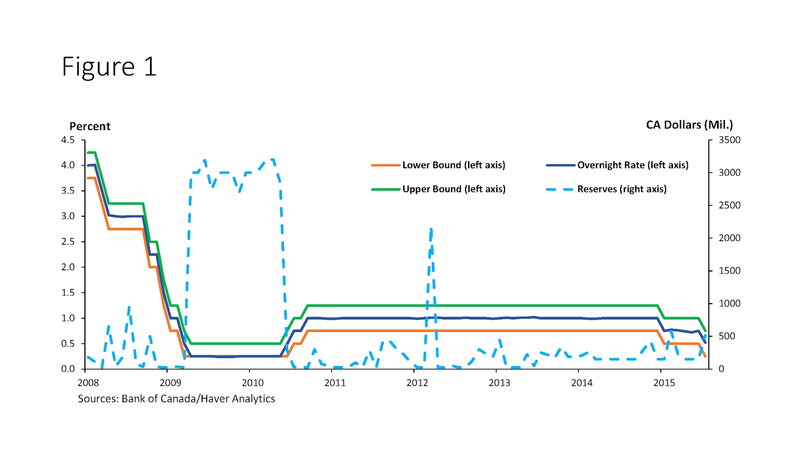 The normalization plan also states that balance sheet reduction will occur after interest rate increases happen, and that no outright sales of assets in the Fed's portfolio are anticipated. Thus, since we have now seen two increases in the target range for the fed funds rate - in December 2015 and December 2016 - it would be understandable if people were anticipating some consideration of the issue by the Fed in the near future. But the Fed's assets, which now consist primarily of long-maturity Treasury securities and mortgage-backed securities, mature over time. As the assets mature, the size of the Fed's asset portfolio will fall naturally, and Fed liabilities will be retired. But that isn't happening, because the FOMC instituted a "reinvestment" policy in August 2010, and that policy has continued to the present day. Under reinvestment, assets are replaced as they mature, the result being that the size of the portfolio stays roughly constant, in nominal terms. 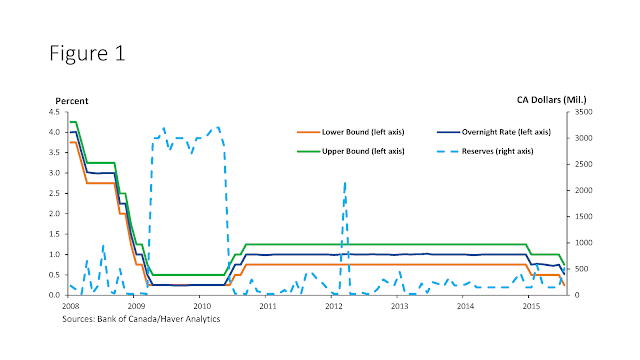 The Fed's normalization plans state that revinvestment will stop eventually, but there are different ways to phase it out. For example, revinvestment could stop abruptly, or the Fed could somehow smooth the transition. 1. There is uncertainty about the effects of ending reinvestment, so the Fed should wait until the fed funds rate is higher, giving it a larger margin to make corrections if something goes wrong with balance sheet reduction. 2. Because the demand for currency is growing over time, this reduces the amount of balance sheet reduction that would be required to return to the pre-financial crisis state of affairs in which reserves are close to zero. 3. There may be good reasons to continue operating a floor system, under which the interest rate on reserves determines overnight interest rates. But, according to Bernanke, it takes a heap of reserves to operate a floor system, giving us another reason to think that the ultimate balance sheet reduction required for normalization isn't so large. Perhaps the most curious aspect of Bernanke's piece is the absence of any explanation of how quantitative easing (QE) is supposed to work. However, it's easy to find a stated rationale for QE in Bernanke's earlier public statements as Fed Chair, for example in his 2012 Jackson Hole speech. Basically, Bernanke argues that QE affects asset prices because of imperfect substitution among assets. Thus, for example, swaps of reserves for long-maturity Treasuries will increase the prices of long-maturity Treasuries, reduce long bond yields, and flatten the yield curve, according to Bernanke. He also claims there is solid empirical evidence supporting this theory. In Bernanke's mind, then, QE is just another form of "monetary accommodation," which substitutes for reductions in the policy interest rate when such interest rate reductions are not on the table. 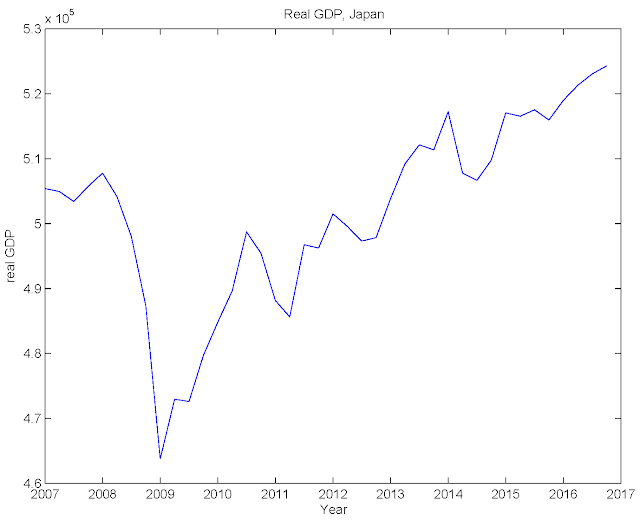 The reductions in long bond yields should, in Bernanke's view, increase real economic activity and increase inflation. ...model simulations of a severe recession suggest that policymakers would be able to use a combination of federal funds rate cuts, forward guidance, and asset purchases to replicate (and even improve upon) the economic performance that hypothetically would occur were it possible to ignore the zero lower bound on interest rates and cut short-term interest rates as much as would be prescribed by a fairly aggressive policy rule. So, that's consistent with Bernanke's post. Bernanke argues that it was necessary to use QE in 2008 and after because the Fed was constrained by the zero lower bound on nominal interest rates. More accommodation was needed, according to Bernanke, and QE provided that accommodation. Reifschneider says that's exactly what the FRB/US model tells us. QE (along with forward guidance) effectively relaxes the zero lower bound constraint. That is, QE is just like a decrease in the target for the policy interest rate. For several reasons, FRB/US is well-suited for studying this issue. For one, it provides a good empirical description of the current dynamics of the economy, including the low sensitivity of inflation to movements in real activity. 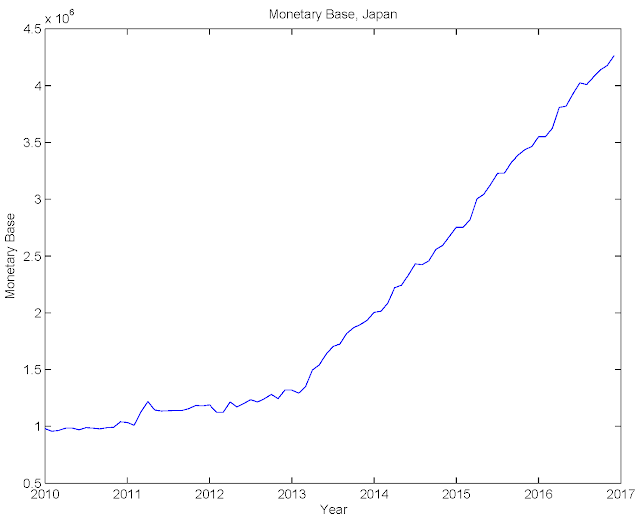 In addition, the model has a detailed treatment of the ways in which monetary policy affects spending and production through changes in financial conditions, including movements in various longer-term interest rates, equity prices, and the foreign exchange value of the dollar. So, Reifschneider hasn't really told us why using this model is the right thing to do in this circumstance, but he's told us something about how the FRB/US model works. You can read about the FRB/US model here, and even figure out how to run it yourself if you have the inclination. The FRB/US model is a descendant of the FRB/MIT/Penn model, which existed circa 1970. In fact, if we could resurrect Lawrence Klein and show him the FRB/US model, I'm sure he would recognize it. In spite of the words in the FRB/US documentation that make it appear as if the model builders took to heart the lessons of post-1970s macroeconomics, FRB/US is basically an extended IS/LM/Phillips curve model - without the LM. Monetary policy is transmitted, as Reifschneider tells us in the above quote, through asset prices. So how would one use such a model to capture the effects of QE? ... the model’s asset pricing formulas provide a way for long-term interest rates and other financial factors to respond to shifts in term premiums induced by the Federal Reserve’s large-scale asset purchases. The effects of asset purchases on term premiums used in this study are calibrated to be consistent with the estimates reported in Ihrig et al (2012) and Engen, Laubach and Reifschneider (2015) for the second and third phases of the Federal Reserve’s large-scale asset purchase programs, both of which involved buying assets of a longer average maturity (and thus a larger term premium effect) than the original phase. Specifically, the simulations reported here assume that announcing the purchase of an additional $500 billion in longer-term Treasury securities causes an immediate 20 basis point drop in the term premium embedded in the yield on the 10-year Treasury note; for yields on the 5-year Treasury note and the 30-year Treasury bond, the initial decline is assumed to be 17 basis points and 7 basis points, respectively. Thereafter, the downward pressure on term premiums is assumed to decline geometrically at 5 percent per quarter; this rate would be consistent with the Federal Reserve using reinvestments to maintain the size of its portfolio at its new, higher level for several years, and then allowing it to shrink passively by suspending reinvestment. So, that's quite indirect. In the FRB/US model there are no central bank balance sheet variables. There are equations that capture the relationships among interest rates and asset prices, but there are no asset quantities. Thus, it's impossible to use the model to address directly the question: "What happens if the Fed purchases $600 billion in 10-year Treasury bonds?" To answer the question we have to do it indirectly. What Reifschneider has done is to work with what he's got, which is event studies and regression evidence. This gives him an estimate of the effect of Fed asset purchases on term premia, and he plugs that into the asset pricing relationships in the model. Maybe you're OK with that, but I don't trust it. 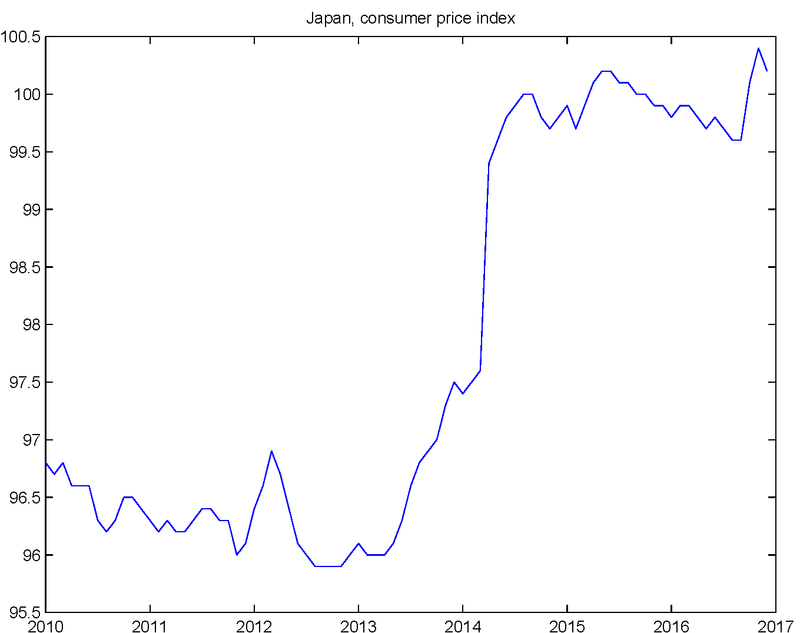 The price level went up alright, but part of that was due to an increase of three percentage points in the consumption tax in April 2014, which feeds directly into the CPI. Even including that, average inflation has been about 0.7% since April 2013, and about zero for the last two years. So, is QE effective in increasing inflation? Japanese experience says no. 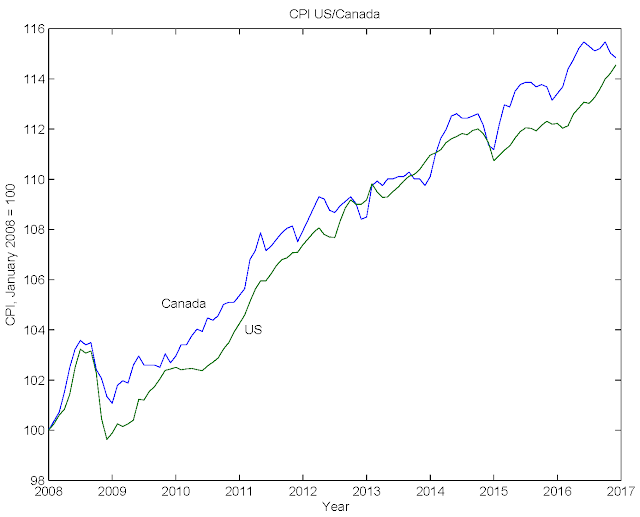 So, since the beginning of 2008, average real GDP growth and average inflation has been about the same in Canada and the US. As an econometrician once told me, if I can't see it, it's probably not there. 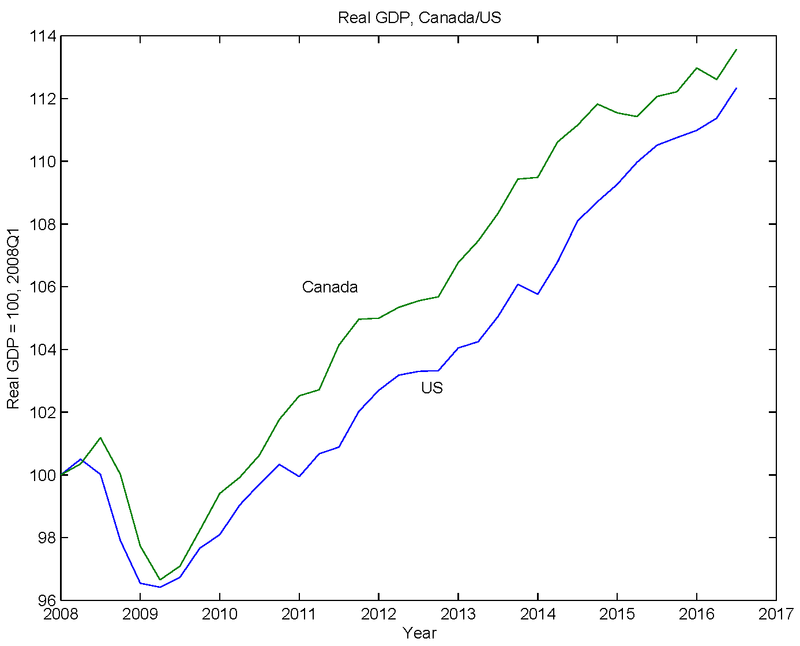 Sure, since Canada is small and is highly integrated with the US economically, Fed policy will matter for Canadian economic performance. 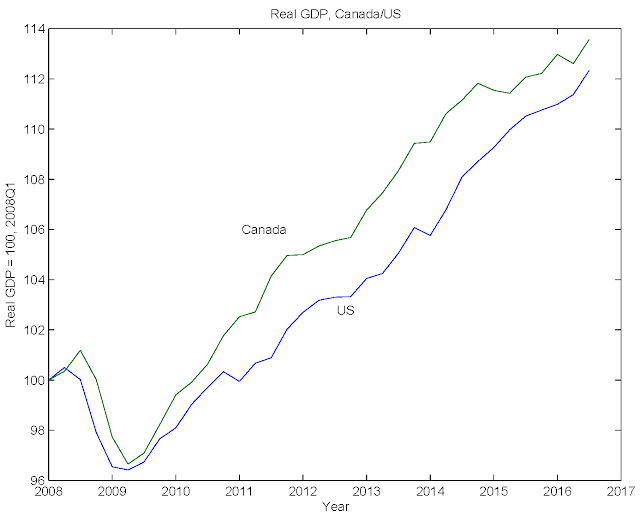 But, if QE were so important, the fact that the US did it and Canada did not should make some observable difference for relative performance. What else do we know about QE? I thought about it a bit, and wrote a couple of papers - this one and this one. Basically, the idea is to think about QE for what it is - financial intermediation by the central bank. If QE is to work, and for the better, the reason has to be that the central bank can do a better job of turning long-maturity assets into short-maturity assets than either the private sector, or the fiscal authority. So, for example, QE could work because the fiscal authority is not doing its job - there is too much long-maturity government debt outstanding. So, if the central bank swaps reserves for long-maturity government debt, that could bring about an improvement, by improving the stock of collateral that supports intermediated credit. Basically, short-maturity assets are better collateral. But maybe reserves are worse assets than short-maturity government debt. Reserves can be held only by a limited set of financial institutions, while Treasury bills are widely-traded, and very useful, for example in the market for repurchase agreements. So, it's not clear that there is an improvement if, for example, the Fed purchases 10-year Treasuries, thus converting highly-useful 10-year Treasuries into not-so-useful reserves. Some of those concerns could be mitigated by an expansion in the Fed's reverse repurchase agreement (ON-RRP) program, but so far that has been operated on a small scale. The chart shows outstanding ON-RRPs, which are a relatively small fraction of interest bearing Fed liabilities (approaching $3 trillion). The chart shows the percentage of Treasury securities held by the Fed that will mature within one year, in 1-5 years, in 5-10 years, and in more than 10 years. Before the financial crisis, these percentages did not vary much, with about 80% of the portfolio maturing in less than 5 years - average maturity was relatively short. In early 2013, average maturity reached its peak, with about 75% of the total portoflio maturing in more than five years, and the remainder maturing in 1-5 years. But, since early 2013, the fraction of the portfolio maturing in more than five years has declined to about 40%, with about 10% maturing in less than one year. So, if one thought that the degree of monetary accommodation was related not only to the size of the Fed's portfolio but to average maturity, then there is considerably less accommodation than was the case three years ago (at least in terms of the Fed's Treasury holdings). Further, if the reinvestment program were halted, the assets will run off more quickly than would have been the case if reinvestment had ceased three years ago. So, you can see that the size of the balance sheet has actually been declining, measured as interest-bearing Fed liabilities relative to GDP. Again, if we took what is in the chart as a measure of accommodation, there is less of it than was the case late in 2014. But how long would it take for this ratio to decline to where it was (0.5%) prior to the financial crisis, if the reinvestment policy stays in place indefinitely. If my arithmetic is correct, about 55 years. Within 55 years, all kinds of things could happen, of course. Ken Rogoff could get his way and 80% of the currency stock could disappear, government currency could be replaced by private digital currencies, etc. So projecting that far into the future is pure speculation. To ensure that the floor rate set by the central bank is always effective, the banking system must be saturated with reserves (that is, in the absence of the interest rate set and paid by the central bank, the market-determined return to reserves would be zero). In December 2008, when the federal funds rate first fell to zero and the Fed began to use the interest rate on bank reserves as a tool of monetary policy, bank reserves were about $800 billion. 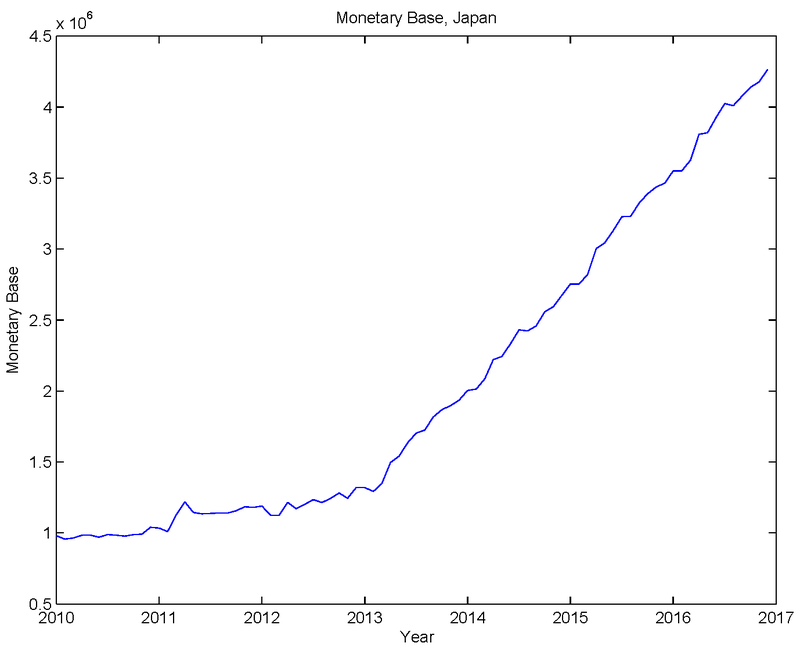 Taking into account growth in nominal GDP and bank liabilities, the critical level of bank reserves needed to implement monetary policy through a floor system seems likely to be well over $1 trillion today, and growing. If you look at the very first chart, you can see what he's thinking. In October 2008 the Fed began paying interest on reserves in the midst of turmoil in financial markets. By the end of the year, overnight rates were essentially zero, and the size of the balance sheet had increased by a very large amount with reserves increasing about $800 billion. So, Bernanke is assuming that, at the end of 2008, it took $800 billion to make the overnight interest rate go to the floor - the IOER. If the balance sheet increase had occurred gradually in a relatively calm financial market, we might take that seriously, but I'm not buying it. 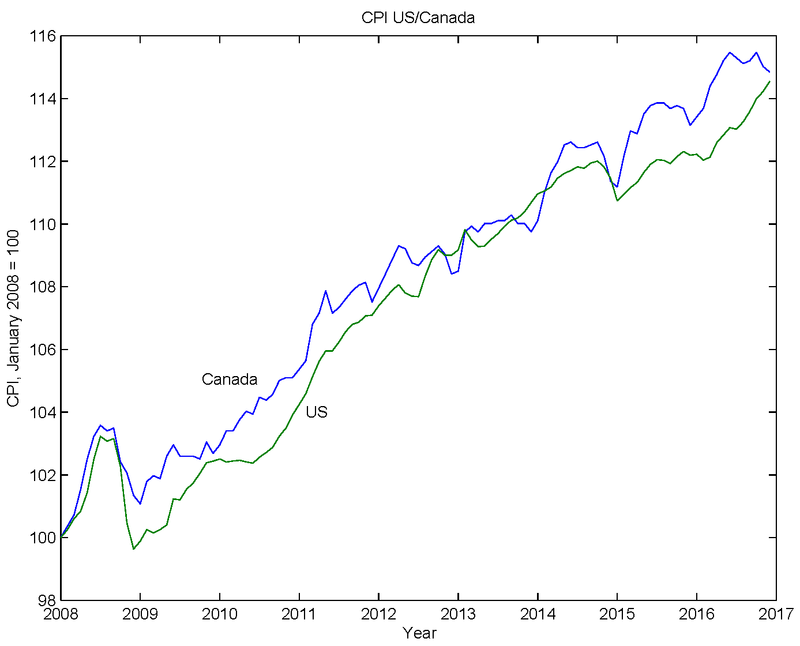 To see this, go back to the fourth chart, which shows what the Bank of Canada was up to. The chart shows three interest rates: (i) the rate at which the central bank lends to private financial institutions (green); (ii) the overnight interest rate the Bank of Canada targets (blue); (iii) the interest rate on deposits at the Bank of Canada - the interest rate on reserves (orange). Normally, the Bank operates a channel system, under which the overnight rate falls between the other two rates. But, for about one year, from Spring 2009 to Spring 2010, the Bank operated a floor system. As you can see, the policy rate goes to the floor for this period of time. How much reserves did it take to make the floor system work? 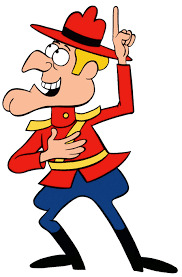 The Bank targeted overnight reserves to $3 billion (Canadian) over this period. To get an idea of the order of magnitude, a rule of thumb is that the Canadian economy is roughly a multiple of 10 of the US economy, so this quantity of reserves is roughly comparable to $30 billion in the US. We need to account for the fact that there are reserve requirements in the US, and none in Canada, and that the US institutional setup is very different (many more banks for example). But, I think it's hard to look at the Canadian experience and think that it takes as much as $1 trillion in interest bearing Fed liabilities to make a floor system work in the US, as Bernanke is suggesting. I would be surprised if we needed as much as $100 billion. So, in conclusion, I think Bernanke's arguments are weak. It's hard to make a case that QE is a big deal, or that stopping the Fed's reinvestment policy is risky or harmful - indeed it might improve economic welfare. Further, if one thinks that QE is accommodative, and that we can measure accommodation by the average maturity of the Fed's asset portfolio, or by the ratio of interest-bearing Fed liabilities to GDP, then withdrawal of accommodation has been underway for some time. 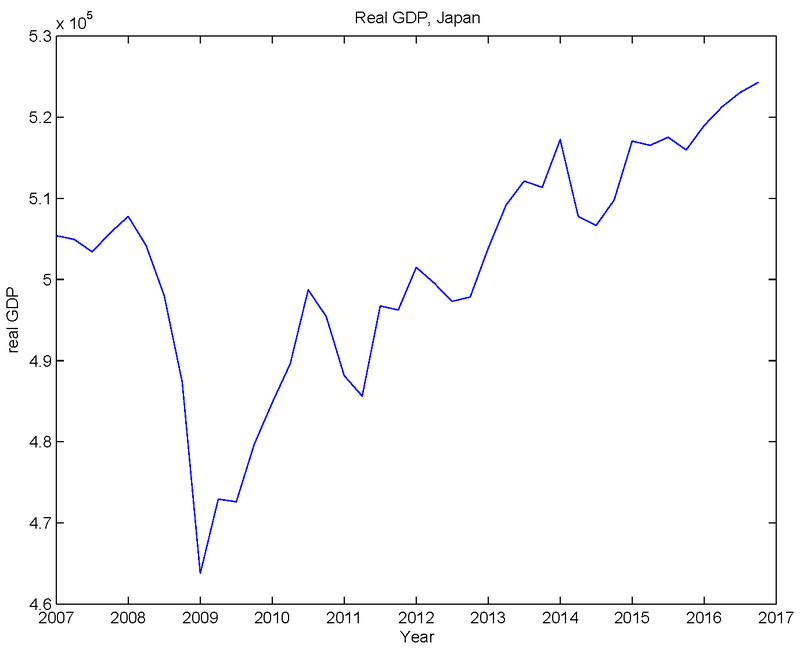 So, you can see that it's the price behavior that's giving the nominal GDP increase. But, most of the price deflator increase is in 2014 - the price level increased by about 4% in a year's time. 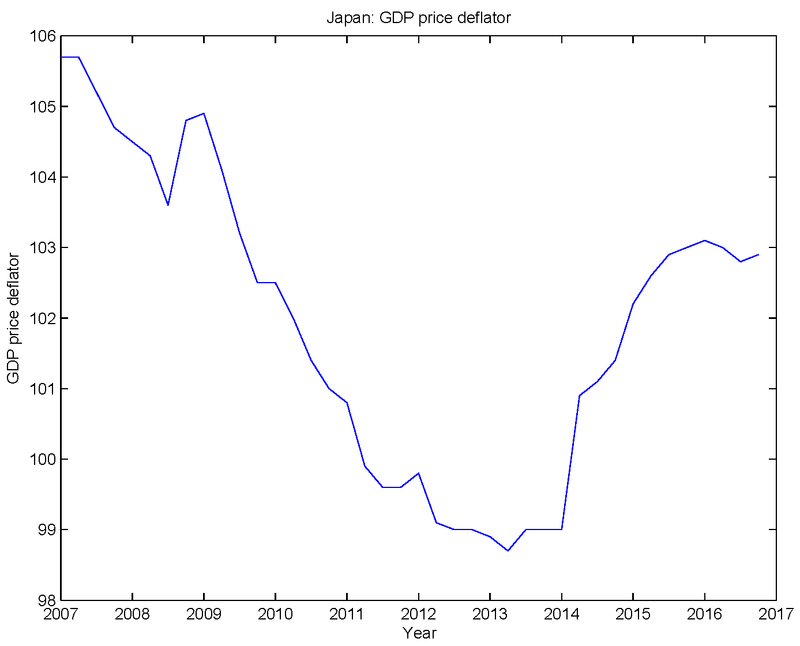 But, again, some of this is due to the direct effect of the consumption tax increase of three percentage points in April 2014. Note that inflation, measured by the increase in the GDP price deflator, has been about zero for the last two years.